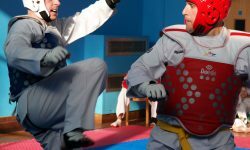 Wessex Taekwondo Association – Our school offers a great club with top quality instruction and instructors who are nationally certified and accredited. Competitions are part of the club’s itinerary, Wessex Taekwondo has pupils who have achieved high accolades in the international Olympic Taekwondo arena. Wessex Taekwondo Association welcomes girls, boys, women, and men of all ages. You will learn the Korean Martial Art of Taekwondo in a safe, secure, family friendly and professional environment. Our Coaches are registered Instructors with British Taekwondo, the National Governing Body for WTF Taekwondo in the UK, and are CRB certified. The classes are structured into 3 general age groups. 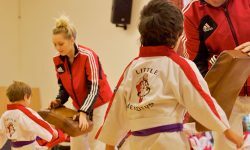 These are Little Leaders for 4 - 6 year-olds, Wessex Warriors 5 - 11 year-olds and Traditional Taekwondo which are for all ages. We teach in Rossmore Leisure Centre, Parkstone, Poole. Lockyers Middle School, Corfe Mullen, Wimborne. Furzebrook Village Hall, Wareham. Wessex Training and Rehab Centre, Poole.